of North America’s 500 fastest-growing technology companies. The SoftArtisans team is a close-knit group of people who like to both share new challenges and have fun. Every day, we collaborate at our desks, over lunch in the common kitchen, or over the foosball table - whether it is to come up with solutions to new programming challenges we've run into, to discuss ways to improve the company, or to make plans for a laser-bagel-cutter-toaster and continuous bread machine (working on the patents). We are encouraged to pursue our individual interests with hackathons consisting of multiple days dedicated exclusively to work on personal projects or to pick up new skills. In one such hackathon our team members built a model car controlled remotely by an Android AI via Bluetooth, picked up a new language, created browser-based game with HTML5, modified git to improve the log interface, and tried out a new restaurant for lunch, all while finishing a release package. 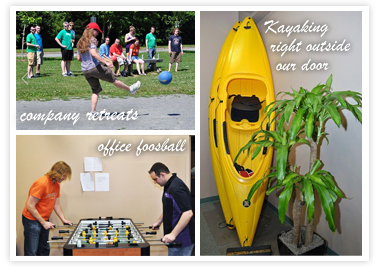 We also hold various after-work activities ranging from yoga to a night of soccer to jumping out of a plane to group charity activities and annual company retreats. Sound like a fun place work? Browse our open job opportunities here. Fifteen years ago, David founded a software company in his basement. Today, SoftArtisans has over 20,000 customers in 70 companies, and its premiere product, OfficeWriter, was acquired by Microsoft in 2007. David was Director of R&D at Logibec (LGI.T), and worked at Société Générale in Paris and Digital Equipment Corp in Massachusetts prior to starting SoftArtisans. You can chat with him about goings on at SoftArtisans/the art of kayaking/Microsoft/Citation Mustangs/poutine on Twitter. Dan manages all things legal, financial and HR for SoftArtisans, and serves as a key member in all short- and long-term business strategies. He received his J.D. from Stetson University College of Law and is a former practicing bankruptcy, consumer protection and corporate reorganization attorney. He is also a fervent member of the Grammarians of Massachusetts and an advocate for SICDS awareness. You can follow him on Twitter, though he doesn’t use it often. Aviva manages support and professional services for SoftArtisans. She has led the SoftArtisans Technical Services team for over 11 years, bringing previous experience as a web developer and educator. Aviva enjoys being the "Voice of the Customer" and overseeing the full lifecycle of consulting projects. Aviva has a BA in Music from Berklee College of Music and studied web programming at Northeastern University and Business at Sawyer Business School. As the VP of Development for SoftArtisans, Sam ensures all things development remain copacetic by working closely with various departments. In the past Sam has worked with both web and desktop applications, ranging from e-commerce sites to Office document processing tools. He received a B.S in Information Technology from Rochester Institute of Technology. Feel free to connect with him on GitHub. Involvement in one of our previous charity programs was having the NEADS dogs come into the office for a day to get acquainted with different office environments and sounds. The dogs would each get someone to shadow for the day participating in office rounds, meetings, and outside walks along the river. This past holiday we took part in a Youth Villages program, Holiday Heroes. With so many families in New England in need of help from basic necessities to holiday gifts, we decided to sponsor various children in need. It was a very rewarding experience for everyone at SoftArtisans. SoftArtisans wanted to bring the Waterown community together to share in strength and pride by hosting a Boston Strong BBQ Fundaiser. 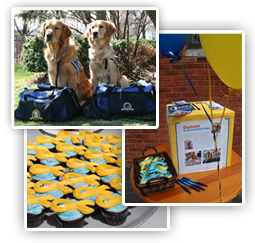 This BBQ benefited the K-9 Comfort Dogs who traveled from Chicago and Newtown, CT to be with the people of Boston after the bombings. The K-9 Comfort dogs are a bundle of furry, affectionate Golden Retrievers, trained to provide comfort and care to those affected by tragedy. They were stationed at First Lutheran Church on Berekeley St. after the bombings and went around to the hospitals to visit those affected. They also provided much comfort to one of our employees, who ran the Boston Marathon. As such, they are a cause very close to our hearts. We were excited by the strong turnout - from students at the Harvard Business School to our next-door business neighbors to those who simply saw the sign and flyers and decided to stop by. Thank you again for coming out to support a wonderful cause and share in the strength and pride of our city. The BBQ raised $350 for the Luteran Church Chairities K-9 Comfort Dogs. SoftArtisans has won many awards over the years for our quality products. Some of our more recent awards are listed below.